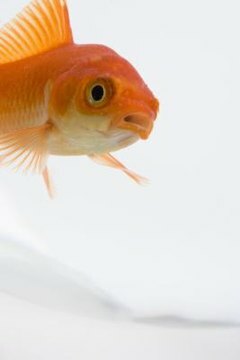 Many things can make a goldfish tank smell bad -- overcrowding, ammonia buildup in the water, decaying food and waste, along with normal algae accumulation. Keep goldfish tank odors from getting out of control or becoming a nuisance by implementing a regular schedule for cleaning and maintenance. You'll eliminate odors, keep your goldfish healthy and give you a sparkling tank to watch. If your goldfish habitat smells particularly bad, transfer your fish into a different suitable container filled with a combination of the existing tank water and fresh dechlorinated water of the same temperature. Completely drain the tank using a siphon, and clean the tank by flushing it with fresh water, agitating the gravel, and siphoning the debris. Use an old toothbrush to scrub decorations and plants, and use a scraper if necessary to get rid of algae buildup on your tank walls and floor. Depending on how soiled and smelly your gravel is, you may want to replace it completely. Make sure your pump and filter are in good working order and that your filter is an adequate size to keep your tank clean. If too many fish live in the tank, or if the pump and filter are inadequate, keeping up with odors will be a challenge. Clean your filter when you clean your tank, and replace your filter as necessary to keep the system in good working order. Goldfish should be in room-temperature water -- anything hotter will increase odors. Use a water clarifying agent on a regular basis to help keep water from getting cloudy and to help break down uneaten food and fish waste. Replace 10 percent to 15 percent of the water in the tank every week with dechlorinated water to reduce smells and improve water quality. Unless it's absolutely necessary, don't do a complete water change more than once or twice a year, or you run the risk of stressing your goldfish. If your goldfish have been breeding and the population has outgrown your existing tank, get a second tank or upgrade to a larger one to better accommodate your pets. Meanwhile, resist the urge to overfeed your fish, which clouds water, clogs filters and creates odors, not to mention is unhealthy for your fish. Follow the flake food manufacturer’s recommended goldfish serving sizes. Remove uneaten food after about 10 minutes.